The Soviet Union was one of the dominant political entities of the twentieth century. The official name was the Union of Soviet Socialist Republics (USSR). The Russian Revolution brought to power the first communist party in history. Lenin and his Bolshevik Party took full advantage of the collapse of the Russian autocracy, followed by the ineffectiveness of the provisional government, to wrest control of the country. The revolution was never in alignment with Marx's theories, since socialism was to be built in a capitalist economy. This problem ultimately proved to be too much to overcome. Efforts to develop a capitalist economy while creating a new socialist government system failed. What resulted was a command economic system with an increasingly totalitarian political system. During World War I, Tsarist Russia experienced famine and economic collapse. The demoralized Russian Army suffered severe military setbacks, and many soldiers deserted the front lines. Dissatisfaction with the monarchy and its policy of continuing the war grew. Under mounting pressure from all sides, Tsar Nicholas II abdicated in February of 1917. Within the military, mutiny and desertion were pervasive among conscripts; the intelligentsia was disaffected over the slow pace of reforms; poverty was worsening; and income disparities and inequality were growing while the provisional government grew more and more autocratic and appeared on the verge of succumbing to a military junta. Deserting soldiers returned to the cities and gave their weapons to angry socialist factory workers. Conditions in urban areas were fertile ground for revolution. Under these adverse conditions, a provisional government was installed, led first by Prince Georgy Yevgenyevich Lvov, then by Aleksandr Kerensky, but it maintained its commitment to the war. The provisional government failed to enact land reforms demanded by the peasantry. More damaging politically was the inability of the provisional government to resolve the war situation, or to move quickly enough toward elections. The promised Constituent Assembly was postponed while the government debated how to include absent soldiers in the voting. This insistence on universal suffrage in the middle of a crisis meant that before the Constituent Assembly was scheduled to meet, the Bolsheviks and their Red Guard had the opportunity to seize power. On October 25, 1917 (according to the Julian calendar then in use in Russia; the date was November 7 in the countries that used the current Gregorian calendar, which Russia adopted in February 1918), Vladimir Lenin led his forces in the uprising in St. Petersburg, the capital of Russia, against the ineffective Provisional Government headed by Alexander Kerensky. For the most part, the revolt in St. Petersburg was bloodless, as the Red Guards led by Bolsheviks took over major government facilities with little opposition before finally launching an assault on the Winter Palace on the night of November 7–8. The assault, led by Vladimir Antonov-Ovseenko, was launched at 9:45 p.m., signaled by a blank shot from the cruiser Aurora. The Winter Palace was guarded by Cossacks, Women's Batallion, and cadets (military students) corps. It was taken at about 2:00 a.m. Official films made much later showed a huge storming of the Winter Palace and fierce fighting, but in reality the Bolshevik insurgents faced little or no opposition and were practically able to just walk into the building and take it over. The insurrection was timed and organized by Leon Trotsky to hand state power to the Second All-Russian Congress of Soviets of Workers' and Soldiers' Deputies, which began on November 7. The Second Congress of Soviets consisted of 649 elected delegates; 390 were Bolshevik and nearly a hundred were left Socialist-Revolutionaries, who also supported the overthrow of the Kerensky government. When the fall of the Winter Palace was announced, the congress adopted a decree transferring power to the Soviets of Workers', Soldiers', and Peasants' Deputies, thus ratifying the revolution. The transfer of power was not without disagreement. The center and right wings of the socialist revolutionaries as well as the Mensheviks believed that Lenin and the Bolsheviks had illegally seized power and they walked out before the resolution was passed. The following day, the Soviet elected a Council of People's Commissars (Sovnarkom) as the basis of a new Soviet government, pending the convocation of a Constituent Assembly, and passed the Decree on Peace and the Decree on Land. When the Constituent Assembly eventually tried to convene, they were turned away by Red Guardsmen. The Decree on Land ratified the actions of the peasants who throughout Russia had seized the lands of the aristocracy and redistributed it. 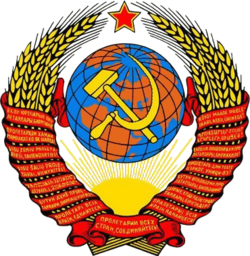 The Bolsheviks viewed themselves as representing an alliance of workers and poor peasants and memorialized that understanding with the Hammer and Sickle on the flag and coat of arms of the Soviet Union. The Bolsheviks, later the Communist Party of the Soviet Union (CPSU), initially enjoyed only a tenuous hold on power. They were also divided among their own party rank and file on tactics and some policy issues. Despite these problems, they quickly consolidated their hold on state power over progressively larger portions of the country, and enacted laws prohibiting any effective rival political party under the banner of "democratic centralism." During the revolution, the Bolsheviks had adopted the popular slogans "all power to the Soviets!" and "land, peace, and bread!" Soviets were councils assembled locally within a city with delegates elected from the workers of the various factories and other businesses. Soviets were the bodies of direct popular democracy; although they held no official position of power in the provisional government, they exerted considerable influence over the hearts and minds of the working classes. After the revolution, the "democratic" element of democratic centralism was expressed in the party leadership's constitution that appeared to recognize the authority of the local Soviets. The highest legislative body was the Supreme Soviet. The highest executive body was the Politburo (see Organization of the Communist Party of the Soviet Union). However, "centralism" soon won out. Arguing that the revolution needed not a mere parliamentary organization but a party of action that would function as a scientific body of direction, a vanguard of activists, and a central control organ, Lenin banned factions within party. He also argued that the party should be an elite body of professional revolutionaries dedicated to the cause and carrying out their decisions with iron discipline. This provided the rationale for putting loyal party activists in charge of new and old political institutions, army units, factories, hospitals, universities, and food suppliers. Against this backdrop, the nomenklatura system would evolve and become standard practice. In theory, this system was to be democratic since all leading party organs would be elected from below, but also centralized since lower bodies would be accountable to higher organizations. In practice, "democratic centralism" was more "centralism" than "democratic," with decisions of higher organs binding on lower ones. Over time, party cadres would grow increasingly careerist and professional. Party membership required exams, special courses, special camps, schools, and nominations by three existing members. In December 1917, the Cheka was founded as the Bolshevik's first internal security force. It later went through many permutations as the GPU, OGPU, MVD, NKVD, and finally KGB. These "secret police" were responsible for finding those viewed by the party as counter-revolutionary and expelling them from the party or bringing them to trial. On September 5, 1918, the Cheka was given responsibility for targeting remnants of the Tsarist regime, opposing parties of the left such as the Social Revolutionaries and other anti-Bolshevik groups such as the Cossacks; this policy would be known as the Red Terror. Said Felix Dzerzhinsky, first head of the Cheka, June 1918, in the newspaper New Life: "We represent in ourselves organized terror—this must be said very clearly—such terror is now very necessary in the conditions we are living through in a time of revolution." Bolshevik-led attempts to seize power in other parts of the Russian Empire were largely successful in Russia proper—although the fighting in Moscow lasted for two weeks—but they were less successful in ethnically non-Russian parts of the empire which had been clamoring for independence since the February Revolution. For example, the Ukrainian Rada, which had declared autonomy on June 23, 1917, created the Ukrainian National Republic on November 20, which was supported by the Ukrainian Congress of Soviets. This led to an armed conflict with the Bolshevik government in Petrograd and, eventually, a Ukrainian declaration of independence from Russia on January 25, 1918 . In Estonia, two rival governments emerged: the Estonian Diet declared independence on November 28, 1917, while an Estonian Bolshevik, Jaan Anvelt, was recognized by Lenin's government as Estonia's leader on December 8, although forces loyal to Anvelt only controlled the capital . These disputes would only be resolved by civil war. One of the first acts of the Communist government was to withdraw from World War I. Following the Treaty of Brest-Litovsk, the Soviet Union turned over most of the area of Ukraine and Belarus to Germany. Immediately, however, supporters of the Tsarist regime broke out in revolt, resulting in years of all-out civil war, which lasted until 1922. Known as the "whites," these forces were aided by Western intervention. Allied armies led by the United States, the United Kingdom, and France, seeking to prevent the spread of communism or Russia's exit from the war effort, attempted to invade the Soviet Union and support forces hostile to the Bolsheviks with the intention of reversing the Soviet takeover. Prior to the revolution, the Bolshevik doctrine of democratic centralism argued that only a tightly knit and secretive organization could successfully overthrow the government; after the revolution, they argued that only such an organization could prevail against foreign and domestic enemies. Fighting the civil war would actually force the party to put these principles into practice. The war was fought mainly between the "Reds," who were the communists and revolutionaries, and the "Whites," who were the monarchists, conservatives, liberals, and socialists who opposed the Bolshevik Revolution. Also, a group of nationalist and anarchist movements known as the "Greens," or sometimes the Black Army for the latter, played a much smaller part in the war, harrying both the Reds and the Whites, and sometimes even each other. In addition, the Entente and some other countries intervened on the side of the Whites, which aggravated the civil war. The war was fought across three main fronts—the eastern, the southern, and the northwestern. It can also be roughly split into three periods. The first period lasted from the revolution until the armistice. The conflict began with dissenting Russian groups, the main force was the newly formed Volunteer Army in the Don region which was joined later by the Czecho-Slovak Legion in Siberia. In the east there were also two anti-Bolshevik administrations, the Komuch in Samara and the nationalist Siberian government centered in Omsk. Most of the fighting in this first period was sporadic, involving only small groups amid a fluid and rapidly shifting strategic scene. Among the antagonists were the Czecho-Slovaks, known simply as the Czech Legion or White Czechs (Белочехи, Byelochekhi), the Poles of the Polish 5th Rifle Division, and the pro-Bolshevik Red Latvian riflemen (Красные латышские стрелки,Krasnye Latyshskiye strelki). The second period of the war was the key stage, which lasted only from March to November 1919. At first the White armies' advances from the south (under Anton Denikin), the northwest (under Nikolai Nikolaevich Yudenich) and the east (under Aleksandr Vasilevich Kolchak) were successful, pushing back the new Red Army and advancing towards Moscow. But Leon Trotsky reformed the Red Army, which pushed back Kolchak's forces (in June) and Denikin's and Yudenich's armies (in October). The fighting power of Kolchak and Denikin was broken almost simultaneously in mid-November. The final period of the war was the extended siege of the last White forces in the Crimea. Pyotr Nikolayevich Wrangel had gathered the remnants of the armies of Denikin and they had fortified their positions in the Crimea. They held these positions until the Red Army returned from Poland where they had been fighting the Polish-Soviet War from 1919 or earlier. When the full force of the Red Army was turned on them, the Whites were soon overwhelmed, and the remaining troops were evacuated to Constantinople in November 1920. The frontiers between Poland, which had established a shaky independent government following World War I, and the former Tsarist empire, were rendered chaotic by the repercussions of the Russian revolutions and civil war. Poland's Józef Pilsudski envisioned a new federation (Miedzymorze), forming a Polish-led East European bloc to form a bulwark against Russia and Germany, while the Russian Soviet Federative Socialist Republic (RSFSR) attempted to carry the revolution westward. When Pilsudski carried out a military thrust into Ukraine in 1920, he was met by a Red Army offensive that drove into Polish territory almost to Warsaw. However, Pilsudski halted the Soviet advance at the battle of Warsaw and resumed the offensive. The "Peace of Riga" signed in early 1921 split the territory of Belarus and Ukraine between Poland and Soviet Russia. On December 29, 1922, the RSFSR, the Transcaucasian Socialist Federated Soviet Republic, and the Byelorussian and Ukrainian Soviet Socialist Republics signed a Treaty of Creation of the USSR, forming the Soviet Union by a conference of the representatives, which was confirmed on December 30, 1922 by the First Congress of Soviets of the USSR. During the civil war (1917–1921), Lenin's economic policy, War Communism, entailed the breakup of the landed estates and the forcible seizure of agricultural surpluses. The Kronstadt rebellion signaled the growing unpopularity of War Communism in the countryside: in March 1921, at the end of the civil war, disillusioned sailors, primarily peasants who initially had been stalwart supporters of the Bolsheviks under the provisional government, revolted against the new regime. Although the Red Army, commanded by Leon Trotsky, crossed the ice over the frozen Baltic Sea and quickly crushed the rebellion, this sign of growing discontent forced the party to foster a broad alliance of the working class and peasantry (80 percent of the population), although left-wing factions of the party favored a regime solely representative of the interests of the revolutionary proletariat. Lenin replaced War Communism with the New Economic Policy (NEP), which reintroduced a limited market. Small private businesses were allowed and restrictions on political activity were eased somewhat. The key shift involved the status of agricultural surpluses. Rather than simply requisitioning agricultural surpluses in order to feed the urban population (the hallmark of War Communism), the NEP allowed peasants to sell their surplus yields on the open market. Meanwhile, the state still maintained ownership of what Lenin deemed the "commanding heights" of the economy: heavy industry, such as the coal, iron, and metallurgical sectors, along with the banking and financial components of the economy. The "commanding heights" employed the majority of the workers in the urban areas. Under the NEP, such state industries would be largely free to make their own economic decisions. During the NEP period, agricultural yields not only recovered to the levels attained before the Bolshevik Revolution, but greatly improved. The breakup of the quasi-feudal landed estates of the Tsarist-era countryside gave the peasantry incentive to maximize production. Able to sell their surpluses on the open market, peasant spending boosted the manufacturing sectors in the urban areas. As a result of the NEP, and the breakup of the landed estates during the Communist party consolidation of power between 1917 and 1921, the Soviet Union became the world's greatest grain producer. Agriculture, however, would recover from civil war more rapidly than heavy industry. Factories, badly damaged by civil war and capital depreciation, were far less productive. In addition, the organization of enterprises into trusts or syndicates representing one particular sector of the economy contributed to imbalances between supply and demand associated with monopolies. Due to the lack of incentives brought by market competition, and with little or no state controls on their internal policies, trusts drove prices up. The slower recovery of industry posed problems for the peasantry, who accounted for 80 percent of the population. Since agriculture was relatively more productive, relative price indexes for industrial goods were higher than those of agricultural products. This resulted in what Trotsky called the "scissors crisis" because of the scissors-like shape of the graph representing shifts in relative price indices. Forced to produce more and more grain to purchase consumer goods from the urban areas, some peasants withheld agricultural surpluses in anticipation of higher prices, contributing to mild shortages in the cities. This speculative market behavior was frowned upon by many Communist party cadres, who considered it exploitation. In the meantime the party took constructive steps to offset the crisis, attempting to bring down prices for manufactured goods and stabilize inflation, by imposing price controls on key industrial goods and breaking up the trusts in order to increase economic efficiency. Since succession mechanisms had not been established in party procedure, Lenin's death in 1924 heightened fierce factional fighting in the party over the fate of the NEP. The Left Opposition within the party, led by Trotsky, had long opposed the NEP for various ideological and practical reasons (the market system was beginning to create negative results typical of capitalism: inflation, unemployment, and the rise of a wealthy class). They used the "Scissors Crisis" to gain ideological capital over the right wing of the party (supportive of the NEP), led by Nikolai Ivanovich Bukharin. But while the left and right were fighting over economic policy and Marxist theory, Stalin was maneuvering for political advantage. For more on the succession battle within the party, see Communist Party of the Soviet Union. In order to devise a pretext for abandoning the NEP, Stalin moved to exploit the problems associated with the "Scissors Crisis," cynically adopting Trotsky's arguments. He vilified the "Nepmen" (small retailers profiting off the growing urban-rural trade) and Kulaks (the emerging upper-middle class of wealthy peasant farmers) under the NEP as new capitalistic classes. He cynically adopted the arguments used by his enemies in the Left Opposition, focusing on the so-called evils of the market, such as inflation and unemployment. Initially, Stalin united with the Bukharinite faction of the party to defeat Trotsky, who Stalin considered to be a greater potential rival because of his charisma. With Trotsky safely exiled, he turned against the right-wing supporters of NEP in order to consolidate his control over the party and the state. He adapted the "leftist" stance that opposed market agriculture because they wanted to produce the material basis for communism quickly, through a planned economy, despite unfavorable conditions. But he also endorsed the "rightist" faction's notion of "socialism in one country," which favored concentrating on internal development rather than exporting revolution. In that respect, he also favored extensive exports of grain and raw materials; the revenues from foreign exchange allowing the Soviet Union to import foreign technologies needed for industrial development. Stalin first formed a troika with Zinoviev and Kamenev against Trotsky. Then, with Trotsky marginalized and removed from his position as People's Commissar of War and a member of the Politburo, Stalin joined with Bukharin against his former allies. Then, finally, he turned against the NEP, forcing Bukharin, its main proponent, into opposition and leaving Stalin as the dominant figure in the party and the country. By then, Stalin had a reputation as a revolutionary, "devoted Bolshevik," and Lenin's "right hand man." However, in reality Lenin had distrusted Stalin, and before his death had written a letter, often referred to as Lenin's Testament, warning against giving power to Stalin, calling him "rude," "intolerant," and "capricious." Stalin and his supporters covered this letter up. Parts of it were leaked to members of the party but the full contents were not published until after Stalin's death in 1953. This page was last modified on 14 October 2016, at 15:39.